We eat a lot of ground beef. It is relatively inexpensive and can be used in so many different types of family friendly recipes like some of our favorites: Enchiritos, 3 Meat Chili, Preacher’s Macaroni Casserole, and Easy Italian 3 Meat Penne Pasta. Ground beef is like a blank canvas to us busy home cooks! The not so glamorous part has always been having to drain the grease from the meat, which is why I was so excited when Michelle contacted me about the Easy Greasy. Michelle is a mom that got tired of dealing with the grease issue when making meals for her family and she did something about it! It works absolutely beautifully, and I will not cook ground beef without it! The Easy-Greasy is available to order from lakeside, QVC, itdcommodities, and Amazon. This Taco Salad is one of our family’s absolute favorite ways to use ground beef. My daughter loves it so much she has nicknamed it ‘Aunt Bee’s World Famous Taco Salad’. I hope your family loves it as much as ours does! Wow this taco salad looks so fantastic and easy to make! Loving how I can see the crunch in it ! Awesome recipe! Thanks for sharing!!! I’ll definitely want to try this! First off, I love the Taco Salad recipe. Second, thank you for featuring one of my recipes. Taco Salad is one of my favorite salads! This looks fantastic!! I so love this Brandi, just right up my alley! I’ve loved taco salad FOREVER and yours looks so easy and full of flavor. I have to try it. Thanks for a great post! Taco salads are one of our favorite dinners and I’m always looking for new twists…I’m so happy I found yours! well done!! This is absolutely stunning Brandi! YUM! Looks tasty and will be WORLD FAMOUS soon! Pinning! I love taco salad! This one looks amazing! I love when a dish comes out better than you could ever have imagined! 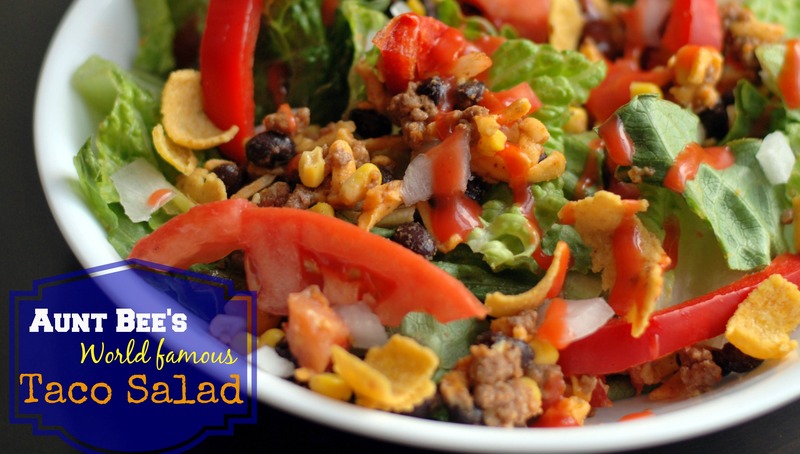 We adore taco salad here and I love it even more with the corn chips! !